Congenital anomalies can lead to still births, infant mortality or permanently disabling and need lifelong management. They may not always be genetically acquired; nutrition, environment and infections also play a role in children being born with severe birth defects. In the Western Europe, the most common birth defects include congenital heart disease, followed by limb defects and anomalies of the urinary and nervous system. A deep understanding of human embryology can therefore equip physicians with the necessary knowledge to identify the abnormalities in the underlying mechanisms of fetus formation that lead to birth defects and how they can be prevented, managed and treated. Expansion of the science of embryology has led to revolutionary technological advances in the field of fertilization technology and stem cell research. 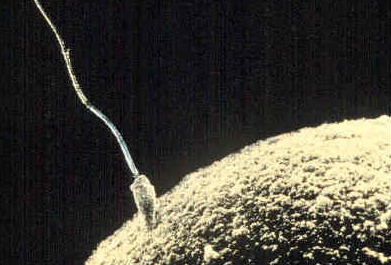 Being able to manipulate and isolate embryological cells at different stages has resulted in scientists mastering techniques, such as in vitro fertilization (IVF) consisting of fertilizing eggs and sperm outside of the body, growing them in the right condition and implanting the zygote (the fertilized egg) back into the mother’s body. Similarly, the study of embryology has given an insight into the development of a human baby from a group of pluripotent stem cells that can be utilized for various therapeutic uses in later life. 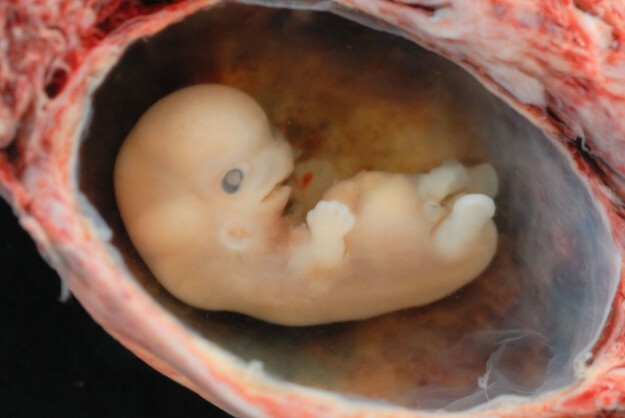 The female fetus starts the production of human eggs nine weeks after conception. Ovum is the female gamete that has a haploid nucleus (23 chromosomes instead of the normal 46 seen in all the other diploid cells of the human body). The unfertilized ovum is surrounded by protective layers of cells known as Cumulus oophorus. Corona radiata is the deepest layer of the Cumulus oophorous; it lies right on top of the Zona pellucida and functions to provide the cell necessary proteins. 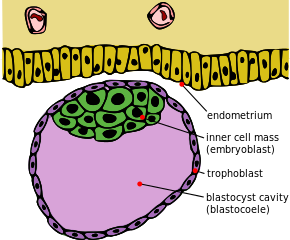 Zona pellucida: A glycoprotein coat that overlies the plasma membrane of the ovum and plays an important role in the acrosome reaction – contact of the sperm with the Zona pellucida resulting in the release of digestive enzymes from the acrosome of the sperm, allowing the sperm to fuse with the plasma membrane of the ovum. 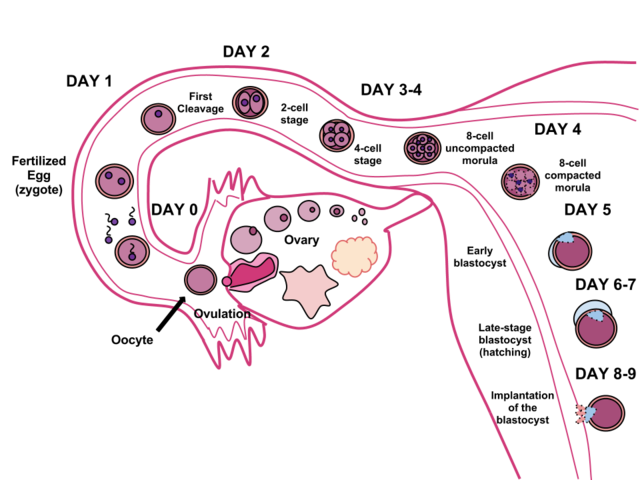 Cortical granules: Play a role in preventing polyspermy after fertilization of the egg by a single sperm; they are secretory in nature, and fuse with the ovum plasma membrane after fertilization. Polar body: Haploid cell that is made simultaneously with the ovum, but lacks the ability to be fertilized. Ovum size: As compared to other cells in the human body, the ovum holds a significance of being the largest in size. 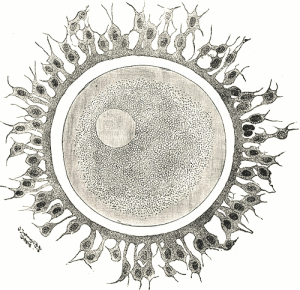 The central enigma around the ovum is that it appears as a seemingly simple cell, but has the potential to evolve into a fully complex human being in the span of 9 months. Cells increase in number – Also includes cancerous cells, that is, when normal cells revert back to their embryological growth and division pattern leading to uncontrolled cancerous growth. Cells increase in kind – Cells differentiate into sub-types which further differentiate into different types of cells that develop specific kinds of tissues. Cells arrange themselves in the body with respect to each other – Similar cells organize themselves in the manner that gives specific structure to the part of the body they are located in. Although DNA is crucial to cell development, it is vital to understand that all cells of the human body consist of the same DNA initially. DNA changes occur due to the switching on and off effect of the genes. The genes are switched on and off in the embryonic state by various chemical and physical indicators, direct influence from adjacent cells and mechanical pressure from the fetal movements. This leads to cell differentiation. Further justification for the fact that DNA in all cells of the body is the same is the example of Dolly the Sheep – first mammal ever cloned using a mammary cell at Roslin Institute, Scotland. 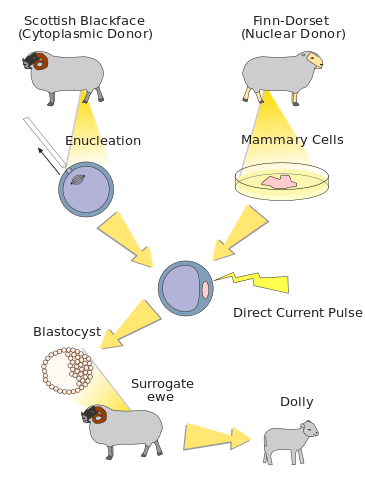 The technique utilized in this revolutionary experiment, somatic cell transfer, clearly illustrated that a mammary cell, a somatic cell (differentiated and diploid) taken from any developed part of the body, could give rise to a fully-fledged and functioning adult sheep. 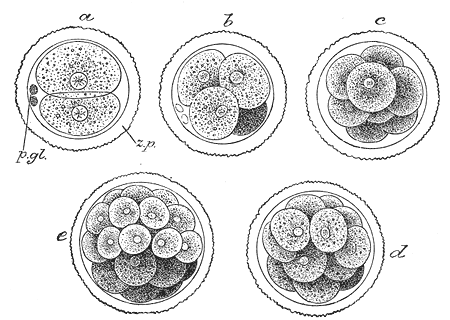 After fertilization, the ovum goes through rapid mitosis but no growth, resulting in the formation of a group of blastomeres in a ball formation known as morula. The morula stage is followed by the formation of the blastocyst, which contains a fluid cavity (blastocele), an inner cell mass and an outer layer of cells called the trophoblasts. The inner cell mass leads to the formation of the embryo and the trophoblasts function to sustain the embryo, eventually turning into a big part of the placenta. How do cells become different from each other? Positional information – the particular location in the blastocyst, where the cells are arranged, majorly regulates what kind of cells they will differentiate into later in the embryologic development. For example, in an experiment, if a group of labeled cells are located in the inner cell mass, then it will surely contribute in the formation of the embryo in the later development. Similarly, if labeled cells are located among the trophoblasts, then it will eventually differentiate into being a part of the placenta. Local signals in different areas in the primitive embryo, that lead to differentiation, include varying concentrations of diffusible chemical signals that cause gene expression. Induction is when these diffusible chemical signals cause differentiation in the adjacent and near-by cells within the same area. For example, signaling chemicals that lead to the formation of the retina can be released by retinal cells to nearby cells, resulting in the formation of related eye structures like the cornea and the lens. Cells also migrate from one location on the embryo to another, and differentiate according to their surrounding structures. For example, neural crests cells can migrate into other places of the embryo and differentiate into adrenal medulla cells, pigment cells etc. PAX6 gene encodes for a protein that works as a crucial regulatory factor in eye development in humans, as well as the fruit fly. Fruit flies that lack PAX6 genes, present with the absence of eyes. If human PAX6 gene is incorporated in their genome, the fruit flies develop normal eyes. This indicates that the gene is expressed according to its local environment and evolutionary history of the organism. 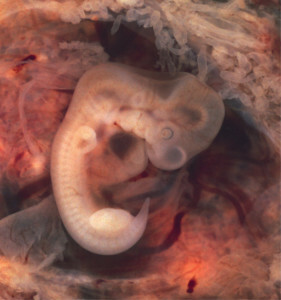 Another example of the same phenomenon is when two morulas from two different strains of mice (one black and one white) are fused together and then implanted in the mother mouse; the baby produced will show a patchwork of 4 different sets of parents. 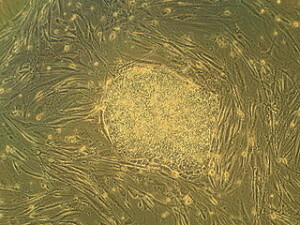 Similarly, if morula and tumor cells are fused together and implanted in the mother mouse, the baby produced will show a patchwork of normal and tumor cells scattered throughout the body, however, the tumor cells will be completely normal in the mouse’s body and not malignant in nature. This is because the local development signals induce the same gene expression in the tumor cells, resulting in them converting into normal mouse cells. 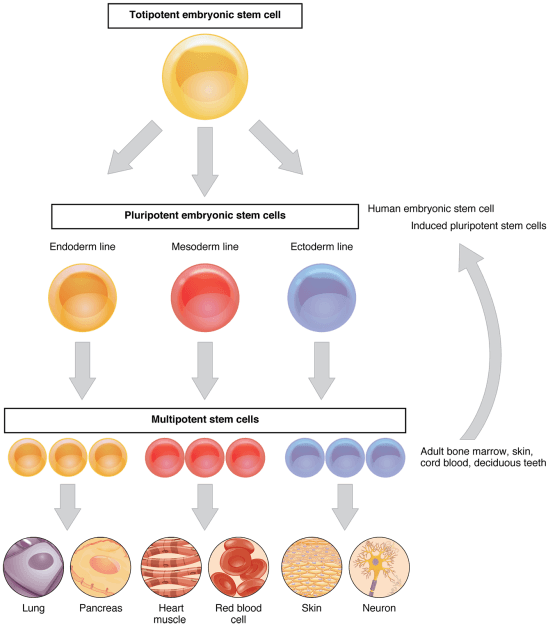 Embryonic cells are pluripotent in nature, that is, they are derived from the inner mass cells and can differentiate into any of the three main germ layers (endoderm, mesoderm and ectoderm) that give rise to the structures of the human body. They can move about in the embryo (migration) and divide at a fast rate. Being pluripotent in nature, embryo cells can shift from an undifferentiated to differentiated phase. All the embryo tissues interact, assimilate and function together, for example, organ cells involving blood vessel cells, so that part of the body can be supplied with blood when it fully develops. Cell growth and division are strictly regulated in an adult human using mechanisms such as apoptosis (programmed cell death). Cancer cells are able to defy all of cell inhibitory mechanisms of the body (like apoptosis) and grow at an uncontrolled rate. They metastasize – leave their original location, spread and invade nearby tissues and other distant parts of the body. Abnormality in the tumor suppressor genes in cancer cells is responsible for giving cancer cells the ability to resist inhibitory signals. In contrast to embryo cells, cancer cells can shift from a differentiated to de-differentiated stage. The more undifferentiated they get; the more difficult it is to control and kill them. Poorly differentiated cells cancer shave – worst prognosis. In order to sustain their own survival, cancer cells are able to start angiogenesis, that is, the development of blood vessels within the tumors to supply the growing cells with oxygen and nutrients. Human development starts from fertilization and continues after birth until the person turns into a fully-developed adult and eventually dies; this process is known as biological ageing. Both embryo and cancer cells are considered immortal in nature due to their endless potential of development. They can be isolated, stored, grown on cultures and guarantee providing any cell type of the body for future use in medicine or research.